When Charlotte Glynn and James Lund started looking for their first home to buy together, they set their hearts on finding an old property that they could make their own. ‘We saw this cottage online and it looked promising; however, when we first went to view the house we were taken aback by the condition of it,’ recalls James. Deciding to take the renovating plunge, they bought the house and as soon as they got the keys, began the painstaking process of stripping off all of the damaged plaster – including unsightly pink Artex – from the walls. ‘This is when we began to reveal the true beauty of the building,’ explains Charlotte. ‘After getting the fireplace disconnected, James took great pleasure in ripping out the faux stone 1970s gas fireplace, which intruded into the room.’ After a lot of work, a huge original stone fireplace was unveiled, which now makes a wonderful focal point in the room. The couple then brought in professionals to rewire the entire house, treat the timbers for wood boring beetles and install a damp-proof course. ‘Very soon the house looked such a state with all of the work being done. Wires were hanging out all over, and any rotten timbers were removed, leaving just rubble on some floors,’ says Charlotte. Everything was stripped out including the kitchen, old electrics and bathroom. Charlotte and James had seen in the loft that there were beautiful A-frame beams above the bedroom, so they quickly made the decision to rip out the existing ceiling to expose the beams. Luckily they were able to stay with family while the project was completed, and although it was a messy job and a lengthy process to restore the beams, it was worth it, and this is now their favourite part of the cottage. 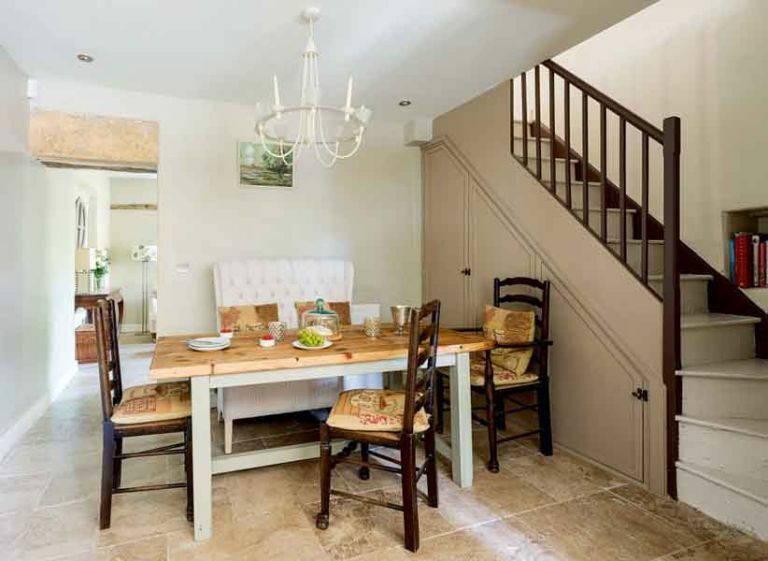 Travertine stone flooring was then installed throughout the ground floor and upstairs they restored the original floorboards where possible and painted them in Farrow & Ball’s Skimming Stone, which helps bring light into the rooms, whilst maintaining the authenticity of the cottage. ‘Keeping the flooring the same throughout the downstairs has really helped with creating a flow from the sitting room to the kitchen. I’m really pleased with how it works,’ says James. During this period Charlotte and James began to make plans for the new kitchen and other cabinetry that they wanted. A local joinery company, Period Joinery, was recommended to them, and after a consultation the company soon got to work on creating the new bespoke oak exterior doors and indoor cabinets. ‘To save money we chose to have these all delivered unfinished, and hand-painted them ourselves. It was time consuming, but saving money in areas like this meant that we were able to splurge on items such as the range cooker,’ James explains. Another important aspect for Charlotte was investing in the best materials they could afford. ‘Cheap paints and fabrics never have the same effect. I would rather wait to buy something in the sale than buy an inferior product. You live with these things every day, so it is well worth the investment,’ she explains. The couple wanted to create a welcoming home where guests would feel instantly at ease and comfortable, rather than anything that was too ‘showy, where one doesn’t know where to sit’. Charlotte chose pretty and feminine floral fabrics to add a printed element to the rooms and introduced lots of textures. ‘I wanted to offset the matt quality of the walls with different textures through rugs and soft furnishings, and the kitchen units were left purposely with a ‘natural’ edge to them to create a contrast,’ she explains. Charlotte shares her experiences of choosing the right colours for her home.